Tony Tomczak is executive director of Corporate Services and chief procurement officer for DTE Energy (NYSE:DTE), a Detroit-based diversified energy company involved in the development and management of energy-related businesses and services nationwide. Its operating units include an electric utility serving 2.1 million customers in Southeastern Michigan and a natural gas utility serving 1.2 million customers in Michigan. The DTE Energy portfolio also includes non-utility energy businesses focused on power and industrial projects, natural gas pipelines, gathering andstorage, and energy marketing and trading. As one of Michigan’s leading corporate citizens, DTE Energy is a force for growth and prosperity in the 450 Michigan communities it serves in a variety of ways, including philanthropy, volunteerism and economic progress. Tomczak is responsible for DTE Energy’s procurement, warehousing, fleet, facilities and real estate operations. Tomczak joined DTE Energy in 2006. He most recently served as director of Supply Chain Management, where he was responsible for all non-fuel purchases, materials planning, contract development and performance and warehouse operations for DTE Energy. Prior to that position, Tomczak served as director of Facilities and Fleet where he was responsible for the maintenance, capital strategy and execution for the real estate, buildings, trucks and equipment and garages across the DTE Energy network. Prior to joining DTE Energy, Tomczak was vice president of Purchasing for Tower Automotive, responsible for materials and services expenditures. Tomczak earned a bachelor of science degree in Industrial Engineering from Purdue University and a master of science degree in Industrial Operations with distinction from Lawrence Technological University of Southfield, Michigan. He participated in the Leadership Michigan program and won Rainbow Push’s Bridge Builders Award in 2010. He is the 2018 Chairman of the board of directors of the Michigan Minority Supplier Development Council. Allen is involved in the community and in business. Currently, he serves on the advisory committee for Be A Middle School Mentor that serves middle school students in Allegheny County through the United Way of South Western PA. He also serves as a board member for the Shyne Awards Foundation. He serves on the Allegheny County and City of Pittsburgh’s Partner4Work(WIB) Board of Directors. He also serves on the City of Pittsburgh’s Advisory Board for Entrepreneurship & Start-Ups. He serves as a board member for Avenu. In addition to serving those community programs Allen established the Will Allen Foundation. The foundation provides tools and resources to Educate + Influence + Empower people in his surrounding community. His business endeavors include investing in real estate, energy and technology companies. Prior to her work in non-profit Cheri spent most of her career consulting & partnering with private sector corporations to reduce resource consumption within their facilities through the implementation of energy conservation technologies and improved operational practices. Mrs. Holman is Past Chair of USGBC West Michigan Board of Directors after serving as Treasurer for 2 years. In early 2008 Cheri founded the LEED for Existing Building Advocacy Group. She served as a subject matter expert for the Green Building Certification Institute (GBCI) LEED for EB Operations and Maintenance test development in 2008 and the Commercial Reviewer exam test development in 2009. In 2010 & 2011 Cheri served as a Greenbuild conference session reviewer. John P. Broschak is vice president of generation operations and compression for Consumers Energy, the principal subsidiary of CMS Energy. Broschak is responsible for the operation of the company’s fossil-fueled, hydroelectric and renewable generating units and gas compression facilities. Broschak last served as vice president of major projects and construction for Consumers Energy. He provided project leadership, management and administration for complex and mission-critical capital investments. He also monitored significant company business risks including air emission reduction projects at company generating plants, construction of renewable and fossil generation, and other large-scale construction projects. Previously, Broschak was vice president of engineering for Wolf Creek Nuclear Operating Corporation in Burlington, Kansas from 2011 to 2014. Earlier, Broschak held increasingly responsible positions at Entergy and Nuclear Management Company. He began his utility career at Consumers Energy in 1992 at Palisades Nuclear Plant after serving as an officer in the U.S. Navy for six years. Broschak earned a master’s degree in business administration from the University of Chicago and a bachelor’s degree in chemical engineering from Pennsylvania State University. He is a licensed professional engineer in the states of Michigan and Kansas. Broschak previously held a senior reactor operator license and project management professional certification. Erik Petrovskis is Director of Environmental Compliance and Sustainability at Meijer. Erik has 20 years of experience as an environmental consultant. At Meijer, Erik is responsible for due diligence, remediation, compliance, and environmental sustainability, with particular focus on stormwater and food waste management. He holds a PhD in environmental engineering from The University of Michigan and is a licensed Professional Engineer. He also served as a Lecturer at the University of Michigan, teaching water and wastewater engineering, as well as sustainable engineering principles. Recently, he was a member of a National Research Council Committee on Scientific Tools and Approaches for Sustainability for the US EPA. David Walz is the Director of Facilities for Kelly Services Corporate Campus in Troy. He has been with Kelly Services for 24 years in facilities management. Prior to Kelly Services he worked in various facility engineering capacities with national bank institutions, major hospital medical centers and mechanical contractors. David led the organization in the achievement of the following honors for 2017, 3-BOMA Outstanding Building of the Year Awards, 3-EPA Energy Star Building Certifications, 4- NAFA Building Clean Air Awards, 2- BOMA Building Designations, 1- MNLA Sustainable Landscape Award, 1-EPA Waste Wise Region 5 Award. Additionally he was awarded the Facility Manager of the year by BOMA Metropolitan Detroit. Furthermore, in 2018 Kelly Services received the BOMA- Outstanding Building of the Year award for the Kelly Corporate Campus. He serves on the White Lake Township Zoning Board of Appeals. David holds a BS in Mechanical Engineering Technology from Wayne State University, a BS in HVAC&R Engineering Technology from Ferris State University, and a MS in Administration from Central Michigan University. Mr. Walz is a LEED AP O&M. He holds the following certifications and licenses. Certified Energy Manger from the Association of Energy Engineers, Certified Air Filtration Specialist from the National Air Filtration Association, and is a licensed Mechanical Contractor and Stationary Engineer from the State of Michigan. Dave Has been the Odawa Casino’s Master Electrician for 11 years. Dave formed the Energy Reduction Committee in late 2009 and they received their first rebate check in Jan. of 2010. Since then they have reduced the annual utility cost for the Odawa Casino by over $500,000.00 a year. Alison Waske Sutter joined the City of Grand Rapids as the Sustainability Manager in September 2017. She has over 15 years of experience in the sustainability field and is a licensed attorney. As the Sustainability Manager, Alison is responsible for managing the City’s Sustainability Plan, which serves as the City’s strategic plan and includes four pillars –environmental quality, social responsibility, economic vitality and governmental accountability. She is currently focused on developing a comprehensive energy plan for the City, which will include strategies for the City to meet its 100% renewable energy goal by 2025 as well as mechanisms to engage other community stakeholders in steep energy reductions. Before joining the City, Alison’s career included sustainability positions with and consulting to the food distribution and retail sector as well as the healthcare industry. She began her career as an environmental attorney with Warner Norcross and Judd in 2006. Alison has also served the community through various volunteer commitments, some of which include serving on the District Advisory Committee for the Grand Rapids 2030 District, as President of the West Michigan Sustainable Business Forum and as an Invest Health Grand Rapids participant. She received her law degree and a Masters of Public Affairs from Indiana University and her Bachelor of Science in Architecture from the University of Cincinnati. In her free time, Alison enjoys spending time outdoors with her husband, son and dog. She has backpacked through a number of our nation’s beautiful parks and participated in triathlons. Alison also loves eating food prepared with local ingredients, whether from one of our fantastic local restaurants or prepared by her amazing husband. Connie has been working within the commercial built environment for over 20 years, with the last 12 years focusing on energy efficiency and sustainability. Connie has served on the 2030 District Exploratory Committee and was instrumental in the launching of the Detroit 2030 District. She has severed on many different industry trade groups including past Vice Chair for the U.S. Green Building Council, Detroit Regional Chapter where she implemented and managed the popular My Green School Art Contest that throughout Michigan. She was past secretary for NAWIC Detroit and received an award for Green Buildings & Construction. Connie has been involved on many other committees with BOMA, IFMA committees and the City of Detroit Green Task Force. Connie is a LEED AP, O & M and holds a Master’s of Business Administration with a focus on Corporate Sustainability. Connie also holds a Bachelor of Science in Journalism and Public Relations. Tamera Lindsay is the CEO at Luna Energy Partners. Providing energy-efficiency and intelligent solutions to Fortune 500 companies, state agencies and electrical contractors, Tamera and her team has converted over 10 million square feet of interior and 200+ acres of exterior space to energy-efficient lighting. She serves as a key instrument in advising companies on energy-efficiency, economic impact, workforce development and revolving funds through lighting and technology. She has a unique strength in combining in-depth knowledge of the industry with the ability to unite and align teams to meet client goals and objectives. Matt Hollander is a Principal of Hollander Development Corporation and oversees the firm's development, design and construction activities. Hollander Development has been engaged in the acquisition, development and operation of affordable housing communities in Michigan since 1979 and is based in Portage, Michigan. It has completed over 40 multifamily communities to date (including mixed-use and historic rehab) using conventional, Department of Housing and Urban Development, Fannie Mae and Michigan State Housing Development Authority financing, which total more than 4,000 homes. HDC’s equity investors have included Related Capital, Boston Capital, Enterprise Social Investment Corporation, Cinnaire Corporation (formerly known as the Great Lakes Capital Fund), Fifth Third Bank, National Equity Fund, City Real Estate Advisors, Bank of Holland and private individual investors. Matt is a LEED AP Homes, Living Building Challenge Ambassador, and President of the Southwest Michigan Sustainable Business Forum. Once out of college, he procured a position working with a government grant program installing and designing Alternative energy systems for Oakland and Livingston counties. He was a project manager for that program until the grant was closed in 2013. Rob has been a healthcare Facilities Manager for 25 years working the last 11 years at Bronson. During his time at Bronson Rob has helped Bronson Battle Creek become one of 23 Energy Star Labeled hospitals in the nation. He is a licensed Power Engineer and previously worked as a construction electrician. Jake is an Engineer in the Michigan Energy Office where he oversees several projects. He is responsible for administering the two LED lighting rebate programs for conversion of building and street lighting within the state. He also manages several grants in support of projects across the state including supporting the 2030 Districts in Grand Rapids and Detroit as well as development of an analytical and advisory software for water treatment facilities. Jake is also in the process of starting a Codes Compliance Collaborative to improve compliance with current energy codes in Michigan. He has a Bachelor’s degree in Chemical Engineering from Michigan State University and worked several years as a process engineer in manufacturing before joining the Michigan Energy Office. Edna Lorenz is the System Energy Manager for Beaumont Health, a not-for-profit organization formed in September 2014 by Beaumont Health System, Botsford Health Care and Oakwood Healthcare to provide patients with extraordinary, compassionate care, no matter where they live in southeast Michigan. The organization consists of eight hospitals with 3,429 beds, 187 outpatient sites, nearly 5,000 physicians, 38,000 employees, and 3,500 volunteers. In the role of energy manager for Beaumont Health, Edna is responsible for setting energy reduction goals, benchmarking hospital performance, and identifying opportunities for improved energy efficiency. Previously, she was an energy and sustainability consultant in Chicago for 9 years where she was active in the ASHRAE Illinois Chapter and key implementer of the City of Chicago Benchmarking Ordinance. Edna received both her undergraduate and master’s degrees in Mechanical Engineering from the University of Michigan in Ann Arbor. She is a Professional Engineer in the State of Illinois, a LEED Accredited Professional, and a Certified Energy Manager. As the Sustainability Coordinator for Grand Rapids Public Schools, Kristen reduces the environmental impact of district operations, while engaging students in meaningful environmental education experiences. Key district initiatives include benchmarking utility usage, planting over 150 trees on GRPS property, and implementing a green cleaning program. Prior to coming onboard with the district, Kristen held the position of Green Schools Fellow with the Center for Green Schools at the US Green Building Council. Kristen sits on the leadership team for the Grand Rapids Community Sustainability Partnership, participates in the Grand Rapids 2030 District, and serves as a board member for the U.S. Green Building Council West Michigan chapter. Kristen holds a BA in Political Science from Alma College and an MPA in Energy Policy from Indiana University – School of Public and Environmental Affairs. 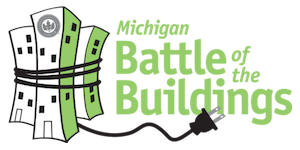 Gillian concentrates on Michigan Battle of the Buildings energy data in accelerating high performance building operations. She manages energy efficiency programming for District 2030 by providing education to stakeholders, developing energy case studies, and monitoring building owners’ progress. Prior to this position, Gillian has researched sustainability opportunities in public transportation, and administered energy efficiency programs for a utility provider. She holds a Bachelor’s degree in Sustainable Energy Management. Gillian is passionate about infrastructure resiliency, energy waste reduction in the built environment, and mitigating climate change. Originally from West Michigan, Matt advocates for restorative design solutions at Catalyst Partners as an Integrative Designer. He is a LEED-AP BD+C, and has managed the LEED Coordination efforts for over 4,000,000 sf of commercial space. Recently, he facilitated the design of Michigan’s first registered commercial Living Building Challenge project, a Tribal College for the Saginaw Chippewa Indian Tribe in Mt. Pleasant. His community work is extensive, and includes co-chairing AIA-GR’s Committee on the Environment. He lives with his wife and three children in Grand Rapids, MI. Lana Crouse works at the U.S. Green Building Council (USGBC) as the Director of Community for Indiana and the Detroit Region. Lana leads USGBC's operations in conjunction with community volunteer leaders by overseeing market development, strategy, event management, and education outreach. In the past Lana held event planning, operations, and account management positions within the organization and first started with USGBC in January of 2004. Her areas of professional oversight include sales operations, event management, client services, development, human resources, and volunteer management. Lana graduated from the School of Public and Environmental Affairs (SPEA) at Indiana University in Bloomington, IN and also received a Nonprofit Management Executive Certificate from Georgetown University in Washington, DC. Doug Widener is the East North Central Regional Director, and Director, Ohio for the U.S. Green Building Council. In this dual role, Widener leads USBGBC Ohio’s operations in conjunction with volunteer leaders and other USGBC staff as well as oversees market development, regional strategy, and USGBC staff and initiatives in Ohio, Michigan, Indiana and Illinois. Prior to his current, from 2012-2016 Doug served as USGBC’s Director of Community Advancement Department and was responsible supporting USGBC’s former77 chapters across the U.S. including training, governance, volunteer engagement and collaborative initiatives between chapters. He also oversaw USGBC’s historic chapter evolution process which involved nearly three years and thousands of USGBC volunteer and staff hours, leading to the integration of over 75% of USGBC’s chapters under USGBC’s collective umbrella while creating more strategic partners with certain still independent chapters. Prior to joining USGBC in August of 2012, Doug spent six years as the Executive Director of the U.S. Green Building Council – Illinois Chapter. In this role he was responsible for the management of the organization and its staff; oversight and implementation of the Chapter’s programs, events and initiatives; as well as financial planning, budgeting, and strategic planning. Previously, Doug spent ten years in a variety of educational roles at the Chicago Academy of Sciences and its Peggy Notebaert Nature Museum; the last four as Vice President of Education. In this role Doug was responsible for the funding, administration, research, development and implementation of all educational and outreach programming for the museum. During this time Doug also served as the co-Chair of the Education Team of Chicago Wilderness - a regional coalition of over 200 institutions working together to preserve the biological diversity of the Chicago region. Doug holds a Master of Science degree in Environmental Studies and a Bachelor of Business Administration degree, both from Ohio University, Athens, Ohio. Outside of work Doug enjoys writing fiction, reading, physical exercise, music, spending time in nature, and spending time with family and friends.